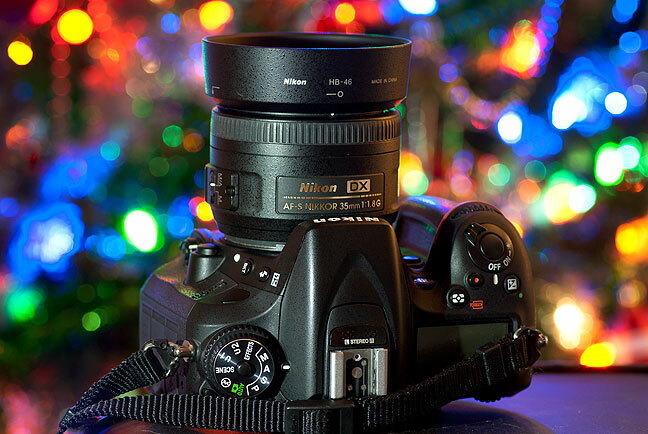 The tools of the holiday trade: a digital SLR, a lens with a nice, large maximum aperture, and my own elegantly decorated Christmas tree. The lens is one of my favorites, Nikkor’s AS-S 35mm f/1.8. As I have taught in the past, “bokeh” is an elusive and often misunderstood aspect of photography. Roughly translated as “blur” or “haze” from it Japanese language origins, it refers to the quality, not amount, of the out-of-focus portions of any photograph. It is an important sub-category of selective focus, using shallow depth of field to govern how the audience perceives the message of the image. The other dog in today’s fight is the 50mm f/1.8, noted as small, lightweight, inexpensive, and viceless. Selective focus can be created using all kinds of techniques, from using lenses of long focal lengths, to shooting at large apertures, to working at very close distances from the subject. All can create an image with a narrow area of sharpness and a very blurred foregrounds and backgrounds. 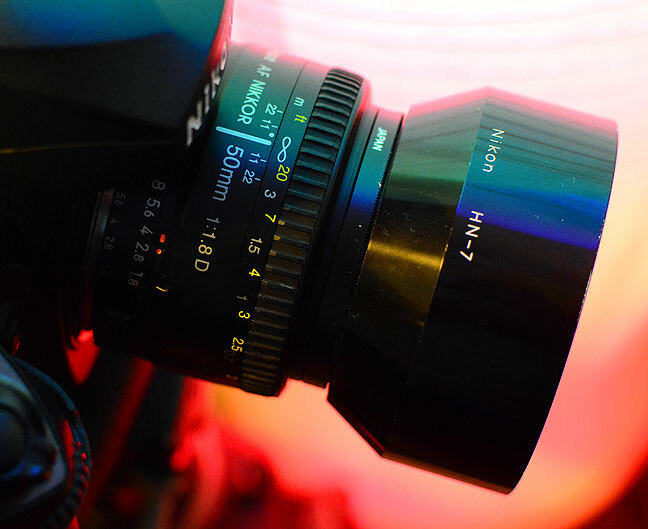 The degree to which we use these methods can control how deep the blurring is, but it is the lens and its optical design that controls the bokeh. I thought of this as I learned that our friend Scott recently picked up an AF-S Nikkor 50mm f/1.4, a lens noted for it’s ability to created strong selective focus with its large maximum aperture of f/1.4. I look forward to seeing some of his stuff and evaluating its bokeh. And this all comes at the holiday season, when it is inviting to try to photograph all that glitters using some aspect of selective focus, and that can be very fun. 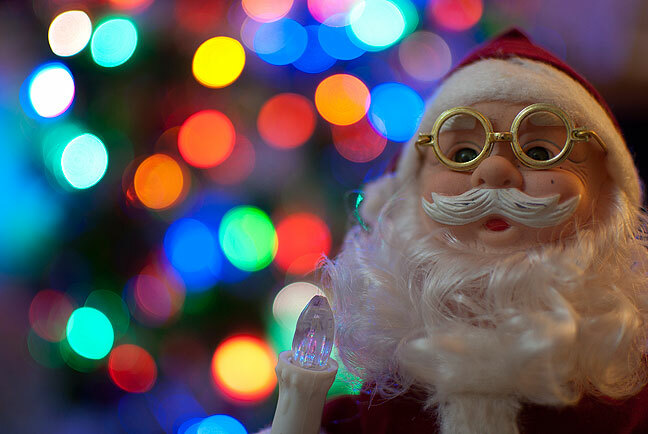 Santa with Christmas tree behind him shot with my 35mm f/1.8 at f/1.8. Note the smooth, even out-of-focus highlights, though they tend to get football-shaped near the corners of the image. Compare the highlights in the previous image to the ones made in this one from the same spot using the same aperture, but with the 50mm f/1.8 lens. Note the slightly crosseyed bokeh and the slight tendency for them to look like doughnuts. As you can plainly see from these examples, bokeh is not imaginary, and it does play a significant role in the character of our images. Extra pro tip: phone no makey bokeh. 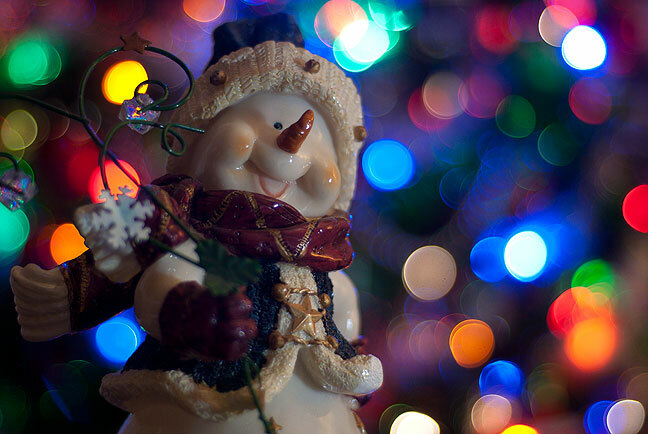 Technically, all images with an out-of-focus area have bokeh. I would only agree that phone cameras aren’t very good at selective focus. I suppose. As you said, bokeh “refers to the quality… of the out-of-focus portions”. I can very precisely select focus with my new phone’s camera, but the quality of the out of focus portions is very poor indeed.